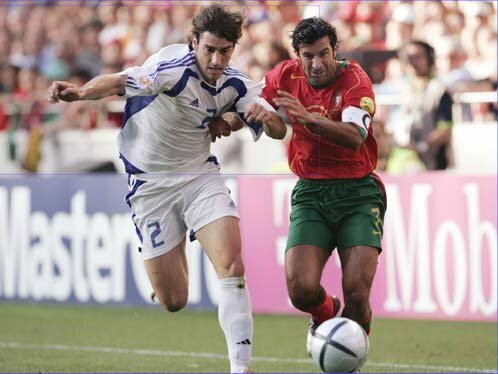 Greece Soccer Team - EURO 2004 Champions - Giourkas Seitaridis - by La Cancha-News On World Cup 2006 - "World's Leading Soccer Magazine!" Giourkas Seitaridis has emerged as a right-back of genuine promise who has effortlessly made the transition from Greece's Under-21 side to the senior team to UEFA European Championship glory. Played his first game for Greece on 13 February 2002 against Sweden, and later that year participated in the 2002 UEFA European Under-21 Championship final round in Switzerland. 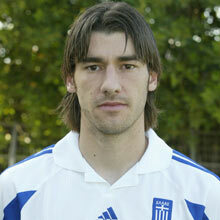 Breaking into the senior team regularly in UEFA EURO 2004 qualifying, his reputation grew and was one of the main reasons Greece were crowned champions, unsurprisingly named in the All-Star Squad. Born in the Athens port of Piraeus, Seitaridis signed professional terms with PAS Giannina FC, for whom he played just eight league matches before joining Panathinaikos FC on a five-year contract in January 2001 as a 19-year-old. Seitaridis made an immediate impact in March of that year with a spectacular 25th-minute goal against Manchester United FC in the UEFA Champions League, a strike only equalised by Paul Scholes in the dying seconds. Although still inexperienced, he played a significant role in his club's run to the following season's quarter-finals and in 2002/03 overcame a temporary loss of form to start 25 Alpha Ethniki matches as Panathinaikos finished runners-up to Olympiacos CFP. The club reportedly rejected summer offers from AS Monaco FC and Valencia CF for the defender. 2003/04: Although Seitaridis ended the season with winner's medals in the league and Greek Cup he was not at his inspirational best, with Itzhak Shum's shuffling of his defence playing a significant part in that. His father, Dimitris Seitaridis, was a striker who also played for Giannina and Panathinaikos, while his uncle, Miltos Seitaridis, and grandfather were both also stars in Greece.